Below are photos of Old Tehran dated to 1848 to 1864, originally posted in the Vintage Everyday website. Readers are also referred to the “Maps and Photos of Old Tehran 1826-1900” posting. The photos have been cited as the first and rare photographs of Qajar Iran by the Italian photographers Louis Montalbone (1827-1877) and Luigi Pesce (1827-1864). Despite the excellent and professional quality of their works, neither Montalbone nor Pesce have been deservedly appreciated in the European fine arts and photography arenas. The Royal Palace (Source: Vintage Everyday). The Citadel (Source: Vintage Everyday). The Bazaar of Tehran (Source: Vintage Everyday). Portal of The Mosque (Source: Vintage Everyday). Soldiers of the Qajar era (Source: Vintage Everyday). Sellers peddling their wares (Source: Vintage Everyday). Qajar prince (Source: Vintage Everyday). Imperial Qajar throne (Source: Vintage Everyday). Imperial palace in Tehran (Source: Vintage Everyday). Below are a number of rare photographs of the Iranian army ranging from (circa) 1921-1941. The acquisition of heavy military equipment (as displayed below) and the formation of more modern units based on armored vehicles in the 1921-1941 period is discussed in Farrokh’s third text Iran at War: 1500-1988 in pages 264-266 (accompanying footnotes in pages 443-444). Iran built up its forces of armored combat vehicles and tanks during the interwar years between World War One and World War Two. Among the first wheeled military vehicles to formally enter service with the Iranian army were the sturdy old British Rolls Royce India (1921) Pattern armored cars armed with Vickers machine guns. Very rare (if weathered) photograph of the four Rolls Royce armored cars in Iranian army service delivered to Iran in 1924. Note the rounded copula. The vehicle was armed with the Vickers .303 machine gun. The sturdy Rolls Royce may have been used by the Iranian army to disarm tribal rebels in Iran’s south and southwest (Picture Source: Matofi, A., 1999, Tarikh-e-Chahar Hezar Sal-e Artesh-e Iran: Az Tamadon-e Elam ta 1320 Khorsheedi, Jang-e- Iran va Araqh [The 4000 Year History of the Army of Iran: From the Elamite Civilization to 1941, the Iran-Iraq War]. Tehran:Entesharat-e Iman, pp. 1045). Iran’s first half-track vehicles were the French-built Citroen (half-tracked) vehicles. Iranian army personnel on maneuvers with what appear to be French made Citroen half-tracks. According to Matofi, these were the first half-tracks to enter service with the Iranian army in 1925 (Picture Source: Matofi, A., 1999, Tarikh-e-Chahar Hezar Sal-e Artesh-e Iran: Az Tamadon-e Elam ta 1320 Khorsheedi, Jang-e- Iran va Araqh [The 4000 Year History of the Army of Iran: From the Elamite Civilization to 1941, the Iran-Iraq War]. Tehran:Entesharat-e Iman, pp.1045). Augmenting Iran’s non-tracked vehicles were the more potent American made LaFrance TK-6 armored car armed with a 37cm main gun and two machine guns of unknown caliber. It is still not clear how many TK-6 types were in Iranian service. American made LaFrance TK-6 armed with a 37mm main gun and two machine guns, built for the Iranian army in 1933 (Picture Source: FSU.edu). Iran also made a special order of Marmon-Herrington armored cars which were delivered by the mid-1930s. [Click to Enlarge] The Marmon-Herrington company designed the above 12 armored cars on specific requirements outlined by the Iranian army. Note that these vehicles have been equipped with a Landsverk type turret which is armed with a Bofors 37mm gun (Picture Source: Marmon-Herrington Yahoo Groups). Another Iranian armored car was the M-H.
[Click to Enlarge] The M-H (1934 series) armored car in Iranian service; twelve of these served with the Iranian army (Picture Source: Network54). At the eve of the Second World War, Iran possessed a force of 102 non-tank armored vehicles. The first tanks (fully tracked – not half tracks like the Citroen cited earlier) to arrive into Iran were the French FT-17 light tanks in 1925. These were armed with the 7.92 mm machine gun. A French-made FT-17 light tank delivered to Brazil in 1921. Iran was to receive its FT-17s four years later (Picture Source: Public Domain). The FT-17 was followed in delivery to Iran by the US-made Marmon Herrington which was also armed with machine guns. A Marmon-Herrington CTL1 (built in Indianapolis, USA) in Iranian service. Note the absence of any heavy gun on the vehicle which was armed with just a single machine gun. Iran possessed 12 of these vehicles by 1941 (Photo Source: FSU.edu). By the onset of World War Two, Iran had less than 200 tanks, with one of the most modern of these being TNH light tanks armed with the 37mm gun. The TNH was highly popular among the Iranian armored corps as well as the Iranian public, who were impressed by these during army parades. Fifty TNH light tanks and fifty AH-IV tankettes equipped the first and second armored divisions (each equipped with 25 TNH and 25 AH-IV [discussed below] respectively). Up to 300 more of these had been ordered by Iran but these never arrived after the Anglo-Soviet invasion of Iran in August 1941. The TNH light tank of the Iranian army first delivered in 1937. Note the Sherman tank (delivered to Iran after World War Two) behind the TNH (Photo Source: (Picture Source: Matofi, A., 1999, Tarikh-e-Chahar Hezar Sal-e Artesh-e Iran: Az Tamadon-e Elam ta 1320 Khorsheedi, Jang-e- Iran va Araqh [The 4000 Year History of the Army of Iran: From the Elamite Civilization to 1941, the Iran-Iraq War]. Tehran:Entesharat-e Iman, pp.1134). Another type of the most modern tanks in the Iranian army inventory before World War Two was the Czech built AH–IV. The AH-IV like all orders delivered by the Czechs to Iran was built specifically to satisfy Iranian specifications. The tanks themselves were manufactured by the Skoda Company with the machine guns built by Skoda’s competitor, Zbrojovka Brno. Iran was to also use large numbers of Brno rifles which were manufactured locally under license (For more on the Brno click here…). An AH-IV tankette engaged in practice drills in a Tehran barracks in the 1930s. Note the TNH light tank in the background (Photo Source: FSU.edu). Despite the rise of the armored corps, cavalry remained Iran’s primary weapon of rapid attack and maneuver. This was because Iran’s armored forces had not yet been able to assume the primary role in such operations. For this to evolve, the Iranian army needed to form a professional cadre of officers cognizant of the latest methods of European armored warfare. Iran did have numbers of such officers trained in European schools, but these could not advance to higher ranks due to overall problems in the upper echelons of command. The article below “Fortifications” by Wolfram Kleiss in the Encyclopedia Iranica was originally published on December 15, 1999 and last Updated on January 31, 2012. Kleiss provides an overview of the fortified passages and defenses of the Sassanians, some of which can be traced back to the Achaemenid era. This article is available in the print volumes of the Encyclopedia Iranica (Vol. X, Fasc. 1, pp. 102-106). Kindly note that the article below contains pictures and captions that do not appear in the Encyclopedia Iranica version. The present article deals with the fortified passages and defenses that are implied under the term bārū. Certain passes in Persia still feature barriers going back to the Achaemenid period. An example is the stone wall at the Kotal-e Sangar in Fārs, which bars the way from Persepolis and Bīšāpūr to Ḵūzestān on the saddle (not a real pass) between the Mamassanī plain (plain of Deh-e Now) and the Fahlīān plain, and which is identical with the medieval and modern caravan route (today’s modern highway between Shiraz and Ahvāz). The rubble wall that by now has almost entirely disappeared was originally 1,230 m long and extended between both sides of the saddle’s rugged, steeply rising rock faces. The construction has been associated with a wall mentioned by Arrian (Anabasis 3.17), which the Uxians are said to have erected as a customs-barrier on the road between Ḵūzestān and Fārs, and around which Alexander had made a great détour on his expedition from Susa to Persepolis before taking it by surprise (Stein, pp. 39-44; Kleiss, p. 213, fig. 1). Another wall (Kleiss, p. 214, Fig. 2) was built on top of the pass 36 km east of Farrāšband and 28 km west of the modern city of Fīrūzābād in the province of Fārs. It overlooks the road between the Sasanian settlements around Farrāšband and the Sasanian round city of Gōr (q.v.) with the bridge over the river west of Fīrūzābād, and is, at the same time, a barrier similar to the one in the Qalʿa-ye Doḵtar area north of Gōr (present-day Fīrūzābād, q.v. ), a fortification at the northern access to the plain of Fīrūzābād (Huff). The barrier on the pass extends over a length of about 200 m in a fairly straight line from northwest to southeast in the shape of a ruined rubble wall that was once of considerable height. On the eastern side of the wall lies a heap of stones, the remains of a small halting-place or a tower, the exact measures of which are unknown. The dating of the barrier is unclear; perhaps it was built in the Sasanian period and continued being used in the Islamic period. The Sassanian City of Firuzabad, known as Gur or Ardashīr-Xhwarra (located in Fars province, approx. 110 km south of Shiraz) (Source: CAIS). Gur is built as a perfect circle measuring at 1,950 meters in diameter and partitioned into 20 sections. The city was surrounded by a primary wall constructed of stamped clay, a ditch measuring at 35 meters width, as well as an inner-wall of defense. Roads over passes were rendered defensible without any specific effort at fortification, but only through the itinerary and the constructive protection of the pass, an example being the Kotal-e Doḵtar on the caravan road from Shiraz via Kāzerūn to Būšehr (Figure 3). The way up to this pass from the Kāzerūn plain could be blocked at any time at its serpentine curves and defended by means of traditional weapons (Nathusius, p. 160). The most important fortification in Persia is the mud-brick wall mistakenly called Alexander’s Wall (Sadd-e Eskandar), which shields the fertile foot-hills leading to the plain of Gorgān against the Turkman steppes. This structure consists of a mud-brick wall stretching out like an embankment, and, adjacent to the wall, 33 forts of varying forms and sizes (120 x 120 m to 300 x 200 m) placed at different distances from one another (400 to 9,850 m). The Gorgān wall (Kiani) was built in the Parthian and Sasanian period as a rampart against attackers, and this function makes it comparable with the Roman limes, constructions in England and Germany, and with the Great Wall of China. The Turkmans call the wall Qïzïl Alan, and in Persian it is also called Sadd-e Pīrūz and Sadd-e Anūšīravān. The Gorgān wall is 175 km long, extending from the Caspian Sea to the Alborz and the north-eastern mountain chains of Persia. The remains of the wall end in the west, north of Gomīšān, at a distance of about 5 km from the Caspian Sea coast, which is due to the variation in the level of the Caspian (now 27 m under sea level) and the very flat level of the coastline. As far as is known, the eastern end of the wall joins the mountain-range at Piškamar, 58 km northeast of Gonbad-e Qābūs, its further prolongation to the east being questionable. The wall is at present 2 to 5 m high and about 10 m wide. A ditch 3 m deep and up to 30 m wide runs along the outer side of sections of the wall. The wall itself is constructed of unbaked bricks (50 x 50 x 10 cm) and baked bricks (40 x 40 x 10 cm). Excavations along the wall and in the forts belonging to it have produced Parthian gray ceramics, Parthian red ware, and glazed Islamic pottery. An Iranian map of the Gorgan wall. The works of Dr. Kiani in 1971 were invaluable in helping lay the basis of mapping the structure. The Gorgan Wall is second only to the Great Wall of China in length. For more on this topic see: Farrokh, K. (2010). The Great Wall of Gorgan: One of the World’s Greatest Frontier Walls. Tehran Times International Daily, March 9, p.7. The Gorgān plain is protected by two fortifications on its western border, at the narrowest part of the flat plain between the mountains and the Gorgān Gulf (Ḵalīj-e Gorgān), east and west of Bandar-e Gaz and south-east of the Caspian Sea. Extending between the foot-hills of the Alborz mountains and the Ḵalīj-e Gorgān coast, the defensive barrier, approximately 11 km long, is now barely recognizable as a very overgrown earth wall with a height of 1 to 3 m and a width of 2 to 2.50 m. The barrier begins near the ruined city of Tammīša (Ṭamīsa/Ṭamīs in Ar. sources) at the foot of the mountains. A further fortified wall running parallel to it is found 22 km to the west, between Bandar-e Gaz and Behšahr (qq.v. ; Kleiss, pp. 215-16). The ruins of Tammīša, near the village of Sar Kalāta, prove to be of Sasanian to Saljuq origin (6th to 9th cents. ), which is probably also true of both walls (Bivar and Fehérvári). The fortified wall near the ruined city of Tammīša at the foot of the Alborz mountains is built of clay and baked brick (36 x 36 x 10 cm). Excavations at the wall and in the Tammīša area produced glazed and unglazed Islamic pottery of the 9th to 15th centuries. In their strategic function, the walls of Tammīša correspond with the fortifications of Darband (q.v. ; Turk: Derbent) in Daghestan on the western coast of the Caspian Sea (Bretanizkiĭ, p. 375, fig. 214; Ebn Bakrān, pp. 81-82). The latter, with their approximately 150 km long wall ascending the Caucasus heights, were to protect the Persian frontier against the tribes of the northern steppes. This construction is also mistakenly called Sadd-e Eskandar, but building details clearly show that the walls are of Sasanian origin and point to a comparison with the structure of the Taḵt-e Solaymān wall in Azerbaijan (Naumann, p. 35, fig. 15). The Darband fortification, which consists of five sections, is about 2,250 m long, from the coast to the western corner of the citadel (arg), and has an interior dimension of 240 to 250 m for the city area. The northern wall features a closer disposition of the towers than the southern wall. Four gates each face north and south, respectively, and the individual sections of the city are connected by additional gates. 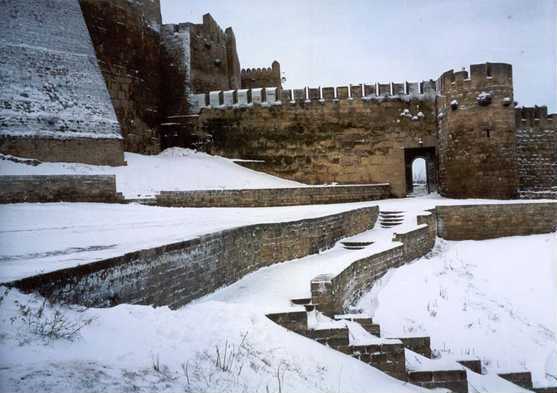 The Wall of Derbent (also known as Krevar to locals) in Daghestan as it appears in winter. This is an enduring testament to Sassanian military engineering in the Caucasus (Source: Public Domain). In its structure as a fortified barrier for the control of a coastline, Darband can be compared with the entire complex of the Byzantine-Turkish fortifications of Trabzon/Trebizond. Between the Black Sea and the Pontus mountains, it attains a length of about 900 m and is divided into three parts: the lower city (Aşağı Hisar), the central city (Orta Hisar), and the citadel (İç Kale; Sinclair, II, p. 48). The Byzantine-Turkish defense walls at Trabzon (Source: Public Domain). The position of the citadel of a fortified settlement in the center of the circumvallation is rare. An original example is the Sasanian to early Islamic citadel on the conical rock in the center of the round city of Dārābgerd (Figure 7). In Isfahan and Shiraz the citadels lie within the walled city; they do not connect with the city wall and have no direct connection with the environment outside the city wall (Figure 8). 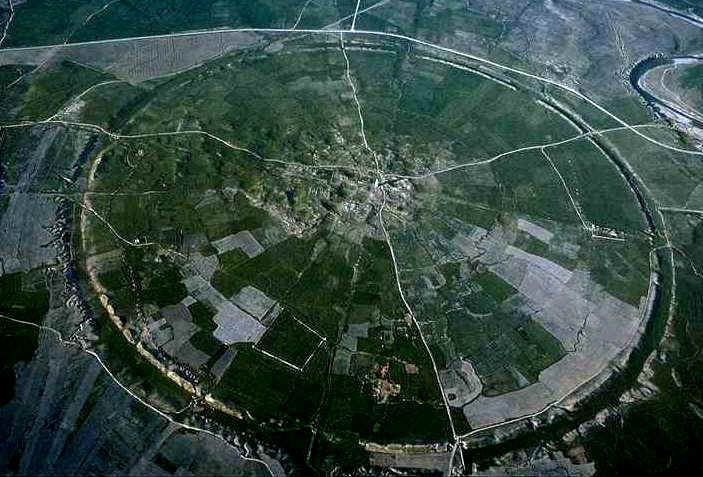 The round city of Darabgerd (Source: CAIS). The citadels belonging to fortified settlements are usually built on sites offering the most suitable terrain for fortifications. As a rule, they are built on heights within the area of the settlement. Most citadels are situated at the edge of the settlements, are structurally connected with the city walls and have gates leading both to the city and to the open country—as is the case with Herat, Bam, Kars, Van, Dāmḡān, or the old town of Tehran. The last wall built around Tehran in the 19th century surrounded the citadel (the Golestān Palace complex) as the center of the walled city. A. D. H. Bivar and G. Fehérvári, “ The Walls of Tammisha,” Iran 4, 1966, pp. 35-50. L. S. Bretanitskiĭ, Zodchestvo Azerbaidzhana XII-XV vv. i ego mesto v arkhitekture Perednego Vostoka Moscow, 1966. Moḥammad Ebn Najīb Bakrān, Jahān-nāma, ed. M.-A. Rīāḥī, Tehran, 1342 Š./1963. D. Huff, “Ausgrabungen auf Qaleh Dukhtar,” in AMI, N.S. 9, 1976, pp. 157-73. M. Y. Kiani, Parthian Sites in Hyrcania: The Gurgan Plain, AMI, suppl. vol. 9, Berlin, 1982. W. Kleiss, “Sperrbefestigungen in Iran und Vergleiche zu europäischen Beispielen,” Archäologische Mitteilungen aus Iran und Turan 30, 1998, pp. 213-14. A. Nathusius, Im Auto durch Persien, Dresden, 1926. R. Naumann, Die Ruinen von Tacht-e Suleiman und Zendan-e Suleiman, Führer zu archäologischen Plätzen in Iran 2, Berlin, 1977. T. A. Sinclair, Eastern Turkey: An Architectural and Archaeological Survey, 4 vols., London, 1987-90. A. Stein, Old Routes of Western Iran, New York, 1940. The textbook “Persian in Use” is a blind peer-reviewed elementary Persian language and culture textbook designed for first-year Persian language students at college level. The textbook is accompanied by an interactive companion website (click here…). Kindly also visit the Facebook page for Persian in Use (click here…). Persian in Use offers a thematically organized and integrative approach to help students achieve proficiency in Persian language and culture. The book is organized around high-frequency topics and provides a clear set of communication goals for each lesson. Authentic materials include samples of literary texts, poems, plays, film scripts, and even pop songs. The article below and the photographs originally appeared in the Historical Iran Blog. The Fortress of Izadkhast is located in the Fars Province of Iran, roughly 135 km south of Isfahan. This historical complex has been situated on a natural base along with unique characteristics. The complex contains the castle of Izadkhast, one caravanserai and the Safavid-period bridge. The works inside of the castle belong to different periods from Sassanids to Qajars. The most important section of the complex is the castle that has been built on singular bedrock in a sand construction and close to the valley of Izadkhast. A bridge and a gate in the most accessible part of the complex made it possible to connect with the surrounding areas. It is, in form of construction, unique but can be, from the-materials-used point of view, compared with Citadel of Bam, Rhine and many other citadels, castles built in provinces of Yazd and Kerman. The complex caravanserai can be compared with Safavid caravanserais especially the caravanserais in Isfahan-Shiraz Route. Inside the walls of the fortress, there are alleyways and passages that criss-cross it. Right by the front gate that goes over a moat, there are many homes that are now fully deserted while some are completely destroyed. According to the locals, as recent as the turn of the millennium, people still lived in the old part of Izadkhast but due to floods in the past two years, the homes were destroyed and people were forced to move. Most of the homes in the interior were constructed from wood and mud. The smallness of the bedrock led to agglomeration of built rooms. Hence, the smallness of rooms resulted in increase of floors, some as many as five stories high which in itself and considering the circumstances of its time is a remarkable architectural feat. The caravanserai at the castle dates back to the time of Safavid Dynasty (1502 – 1736). The front gate was burned down by Nader Shah’s soldiers camping there during a cold night as they were looking for firewood. The bedrock on which the complex is situated on protected the castle from the foreigners’ attacks. The tall and almost perpendicular height, ranging from 6 to 15 meters, on three sides of the fortress made it almost impossible for enemies to gain access to the interior. And for further protection, on the fourth and shorter side, a moat 30 meters long, 4 meters across and 4 meters deep had been dug. Many parts of the Izadkhast fortress have been destroyed as they have collapsed due to erosion and flooding. Inside the walled city, there are clear signs of damage from treasure hunters and unfortunately also graffiti on the walls.